It seems that the ever present wind has finally abated just in time for the arrival of some warmer weather. Yesterday evening we had blue sky from horizon to horizon so decided to pack a picnic and head to Rhossili on Gower to enjoy the sunset. 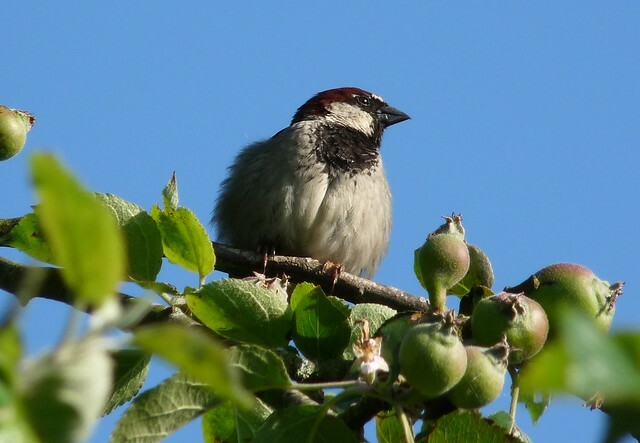 On the way out through the garden it was hard to miss the incessant calling from the resident House Sparrows who have various broods of youngsters secreted away in bushes and under roof tiles. We have seen a few being fed by their parents out in the open but thus far I have not managed to capture them on camera. I did however manage to get one of the Dad's as he proudly defended his territory in the neighbours Apple tree. 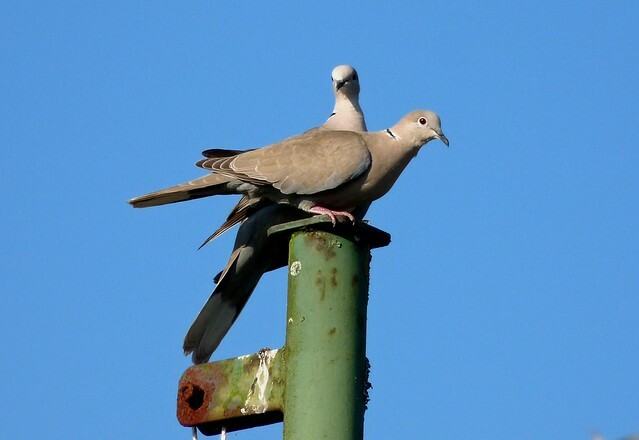 I also got to answer one of life's great unanswered questions; just how many Collared Doves is it possible to squeeze on to the top of a washing line pole? It seems that two is about the limit. Down at Rhossili a fantastic Kestrel was hovering above the path near the coastguard hut, while the Swallows and House Martins were busy hunting around the Worms Head pub. The sea was as calm as a mill pond (something I haven't been able to say for well over a month) but the hoped for Porpoise or Dolphin failed to materialise. 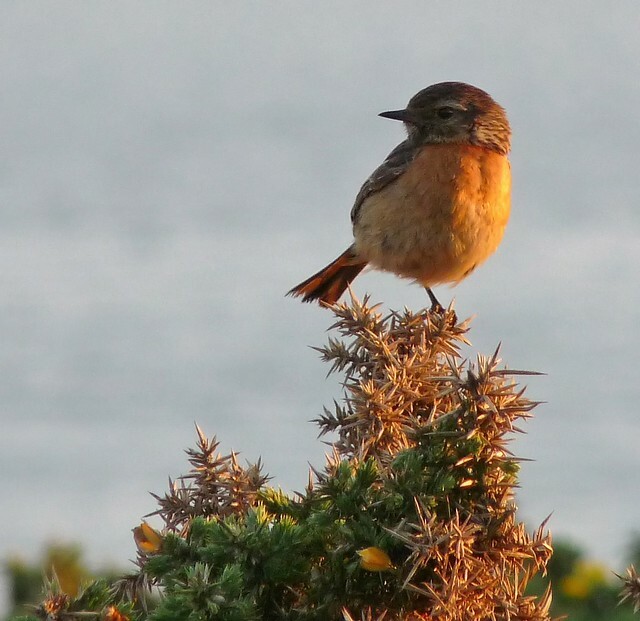 We did bump into a family of six Stonechats though who happily gave me the run-around as I tried to photograph them against the rapidly setting sun. In the end one of the youngsters perched perfectly for a few minutes allowing me to get some very pleasing shots. The sunset itself was very nice to watch but I didn't bother with any photographs as there were no clouds to catch the last rays of light. 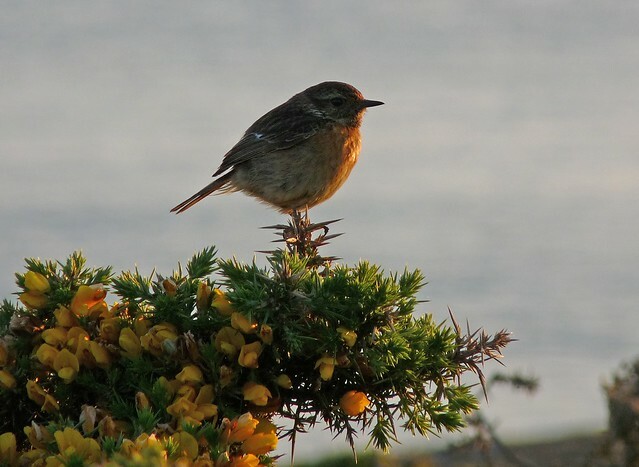 I was happy just to sit there and watch the scene unfold before me whilst listening to the birds sing. Sometimes there is nothing better than to just absorb a place and appreciate it for what it is. I look forward to many similar evenings this summer.